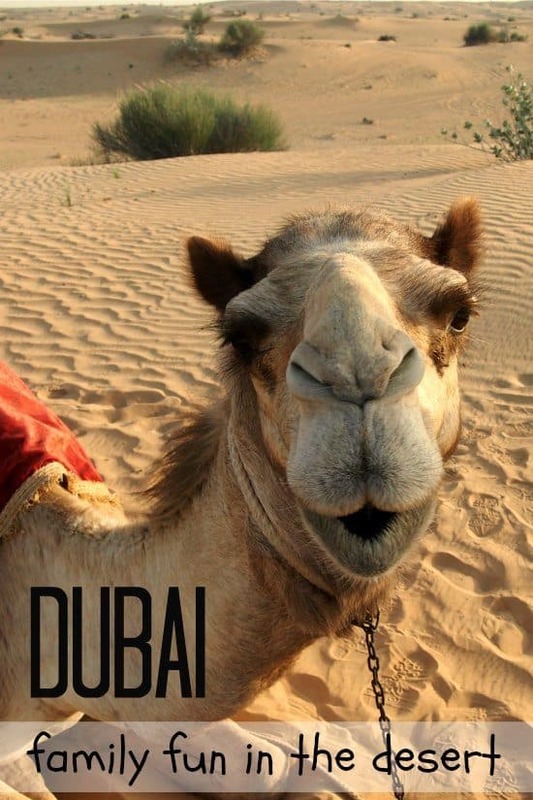 You are here: Home / Asia Travel Archives / Dubai Travel Archives / Dubai Camel Safari in The Desert. 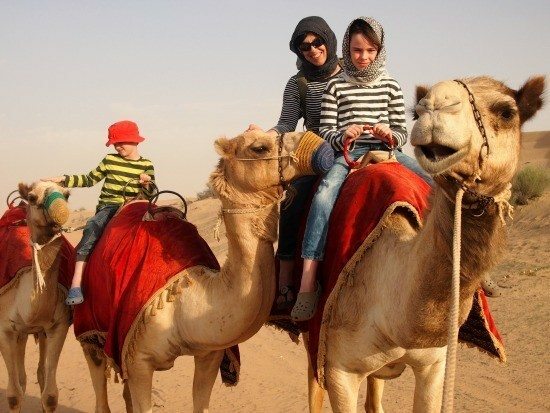 Dubai Camel Safari Review by World Travel Family, specialists in global family travel. ” Last night was the most fun we’ve had in a long time, and that’s saying a lot! The boys and I are in Dubai before catching our cruise ship to Australia and we’re doing our best to get a taste of what this amazing city offers tourists. We already took a cultural tour and lunch which was amazing and educational, visited Dubai Mall, watched the fountain show at the Burj Khalifa and generally had a fantastic time, but you can’t come here without taking a Dubai Camel Safari or at least riding a camel, so that’s what we did. 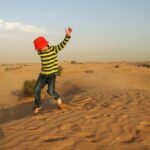 It took some searching to book this desert safari tour, it’s hard to book anything in Dubai, but eventually we found our perfect camel and desert tour online. Our camel ride had to be in the desert not on the beach and we wanted dinner, a show, a pick up and everything to be easy, this trip was perfect.” So perfect that we’ve now taken this Camel Safari and dinner tour twice. 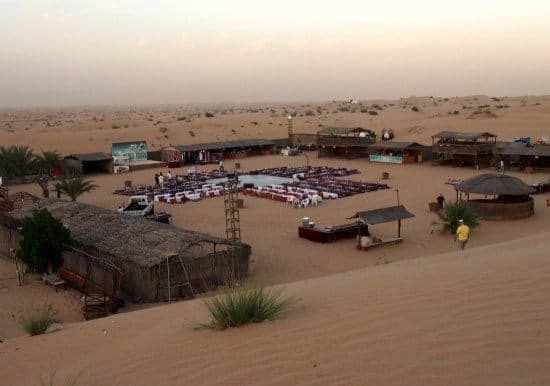 Find out how to arrange your evening in the desert below. You can check out the exact desert safari tour we took here. Highly recommended! 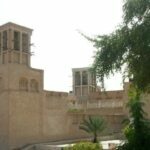 There are various other Dubai, camel and 4×4 desert tours featured further down this page. 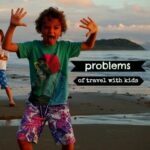 Are 4×4 Desert Safaris Good for Children ? What Was Included in the Dubai Camel Safari? We stayed in a very nice and affordable apartment hotel with washing machine. 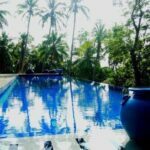 Click through to check prices and availability on Agoda. This is by far the best apartment hotel we’ve used in Dubai out of, now, 3 visits. 2 of the apartment hotels we’ve used in Dubai were very disappointing, old, smelly, tattered. Take a look at the one above, it’s also one of the cheaper options. Apartment hotels are absolutely the way to go in Dubai, Golden Sands is often mentioned, we’ve tried them and they weren’t as good as the hotel above. Try the deals below. 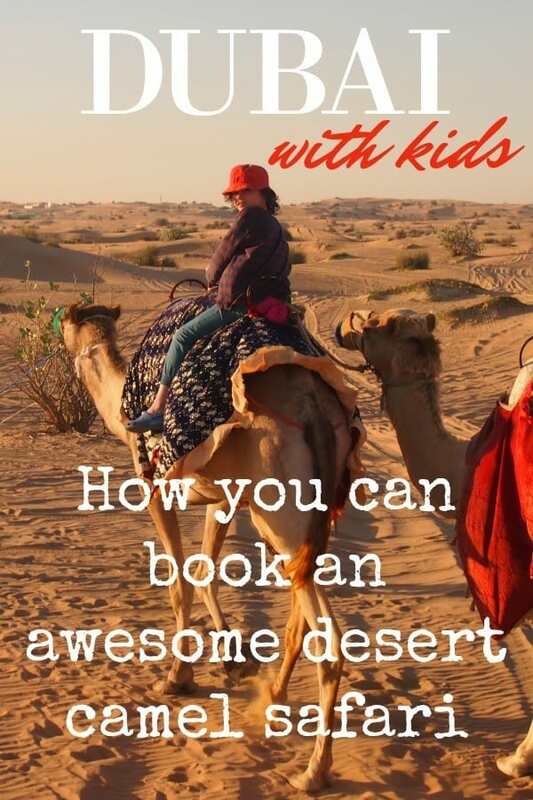 We thought we’d have one big, fairly expensive, touristy splurge on an evening in the desert, with camels, food, belly dancing, the full desert-camp extravaganza. It cost us a fair bit, over $300, but it was totally worth it. My younger child at 8, gets car sick occasionally, but that wasn’t the reason we decided against the dune bashing. I just didn’t think the kids would enjoy it. We owned a 4 wheel drive back in Australia and they never liked being bounced about in the back when we went off road. I read that children struggle to see out of the back windows of the vehicles, which was confirmed to us when we took the short 4X4 trip from the main road to our desert camp. We were squashed in the back row of an 8 seater and the windows were tiny. I don’t think we missed anything by not taking the popular option. If you’d like a little more excitement as part of your safari, dinner and show package, quad bikes are also available. 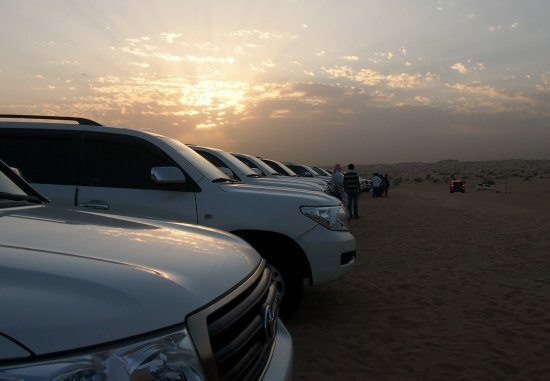 Four wheel drive vehicles converge on the desert camp at sunset. Camels are cool. We wanted camels. Not on the beach ( you can do that in Dubai too), we wanted camel riding in the actual desert, so I spent a morning trying to find a tour that would let us do this without the off-roading. It wasn’t easy, there didn’t seem to be many, but I eventually found one and booked online. The children were blown away by the desert biome and the camels were much better behaved than those we rode at the Pyramids in Egypt. Pick up from our hotel at 3pm in a new, comfortable vehicle. We picked up 4 other passengers. 4 wheel drive transport from the road to the desert camp. A 45 minute camel ride, just the 3 of us. Our camel-wrangler allowed the boys to get off and run around the sand dunes at the half-way point. 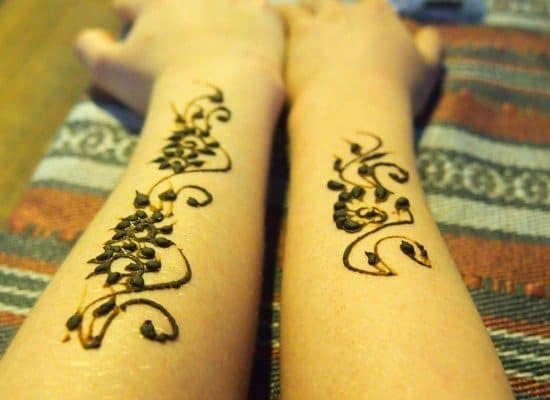 Both the boys went for henna painting during the evening entertainment, the local women were quick and skilled. Dress up in traditional Emirati outfits. Unfortunately there were no child sizes. Dinner at camp, and it was good! A dance show with belly dancing and male dancers doing something very similar to the dervishes in Turkey. Drop off at our hotel at around 9pm. There was a hunting falcon at the camp but no photos without a $10 payment. Endless running up and down sand dunes while mum enjoyed her first and only $10 beer. The desert camp comes alive as the sun sets on Dubai. We loved it. The boys adored the camels and the dunes. Dinner was great, lots of choice and plenty of food. The kids pronounced the dancing “better than expected”. Below is an affiliate link to the company we used, booking through us costs you nothing extra. We booked our Dubai camel safari here, check pricing and availability by clicking through. Highly recommended for the ease of booking, a few clicks and we were done, ready to picked up from our hotel. They offer loads of other quality Dubai tours too, you can see some featured on this page. I’m in a rush, we join our ship tomorrow and my internet time will be limited, just time to squeeze out one last post for our followers. I’ll let the pictures tell the story with this one and tell you that the kids are begging to go camel riding and dune jumping again. If you have any questions just leave them in the comments and I’ll fill in the blanks once we’re back on dry land. I may just share my video of the belly dancer too. If you hover over the images on this page a Pin It button will appear so you can bookmark to Pinterest. Thanks! Update: We did it all over again last year, the same desert safari without dune bashing. 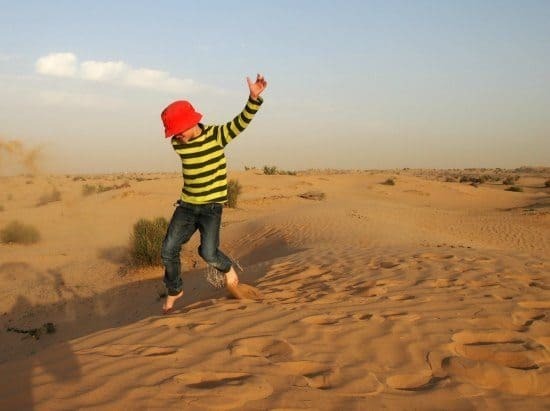 The boys were begging to go back and this Dubai desert safari tour was just as good 2nd time around. We did our research and we think we’ve found the best desert safari tour right here. This is the stuff of childhood dreams and I’m so glad they got to do this, twice. Use our buttons above to book. Hi Amanda, After the 1st paragraph, where it says ” this is the exact one”. That one. The top one that comes up shaded blue. It says ” your pick”. All the ones lower down the page are just other options. Do you think they have changed it since you first went? You mentioned that you did a 45 minute camel ride, but when I followed the link to the site, it refers to a ‘short camel ride’. Falconry & alcohol also no longer seem to be included (though it may mean these are additional extras). Could you take another look at the link and let me know what you think. I’ve looked and yes it is the same as far as I can see. Falcon holding and photos were always extra and of course you have to pay for your own alcoholic drinks. It’s very expensive, I think $10 for 1 beer. 45 mins is a short camel ride, to compare to people looking for extended camel trekking. Great, thanks. There were a couple of reviews I came across of other tour operators where the camel ride was described as being only a minute or so (basically get on and have photo taken & not much more), so wanted to be sure we don’t end up with one of those. Well it wasn’t both times we did it, but I can’t guarantee things haven’t changed. We specified that we wanted a camel ride, that’s why we picked this one. Nice article!!!!! Dubai is a beautiful travel destination in UAE. There are such best places for kids. Dubai is the best city in UAE; I like camel riding Safari tour & your travel is amazing. Thank you very much for sharing your camel riding safari tour information. It looks amazing! I would love it and I’m sure it would be much more exciting travelling by camel than car. I don’t think the boys could cope with the heat in Dubai yet (nor can we afford it! ), but maybe when they’re older and we have more money saved up. I would also like your information on the camel ride and meal. What company was it? Hi, I am planning to visit dubai this year. I’ve read a lot of blogs about the great destinations in Dubai. Indeed your article add something for me to do. 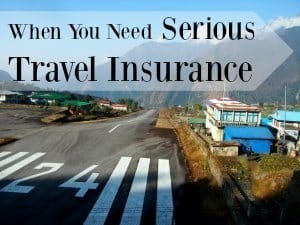 Do you have any recommendation for a 3-day travel? By the way, I am a natural food enthusiast and would like to taste something new every time I travel. I also heard from my Lebanese friends that Filful Beirut is opening in Dubai. Have any idea? We were only in Dubai for 5 days Kris, sorry, can’t help. 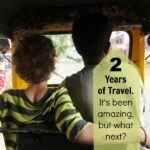 I can’t believe we just missed you in Siem Reap! We were there the same week you were and experienced the power outage on our last night! Tomorrow we fly to Dubai and want to do the camel safari like you did – can you please tell me which company you used? Thanks!! I don’t know, but I know the name is in one of the photos, written in big letters behind the stage. I’ll look.